I'm not really helping the age of paper by having a blog, but I can't help but be mildly disgusted by the lack of reading people are doing this day and age. Our society is quickly making its way towards one that is image-based, and, while that is visually appealing, the written word is, I believe, on its way out. With grammatical travesties such as text speak and so on, I am increasingly alarmed by the youth's blatant disregard for the English language. For example, I was browsing Yahoo Answers the other day and was simply appalled by nearly 75% of the questions as well as their responses. On many, there was no punctuation. Periods, apostrophes, commas... All thrown out the window. Subject / verb agreement was atrocious. These are simple grammar rules that I was taught in elementary school, and young people around the ages of 15 and 16 (Let's face it; the majority of the people on Yahoo Answers aren't above the age of 18.) haven't yet grasped these concepts. This is what we are making out of our future: a society that can neither read nor write. Awesome. Now that I've had my little rant, let's talk about the Kindle. It's an interesting idea, and several of the features are quite helpful. I was looking at one of these (or an off-brand of one of these... I can't remember) at Target a few weeks ago, and I was surprised by the quality of the picture. One of the things that I hate about reading on the internet is that, after a while, it hurts my eyes and gives me a headache. I guess that's a good thing, because it gets me off the computer for a little bit. I was expecting the same thing from the Kindle, but it actually has a book-like appearance, making it easy to read for long periods of time. 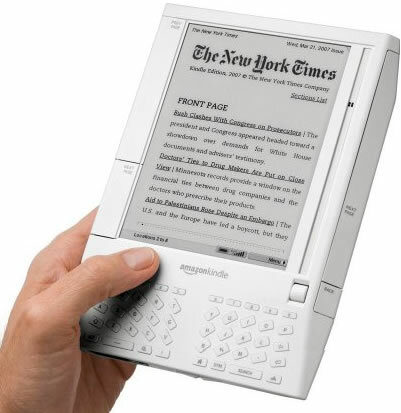 It can hold over 1,500 books at $10 a pop and boasts a 3G network to download entire e-books in as little as 1 minute. In theory, this sounds like a good idea. A multitude of books at my disposal? Yes, please. The more I think about it, however, I grow more and more wary of it. I love the library. This may seem off-topic, but bear with me. Walking through the aisles, browsing its shelves for a cover that looks interesting, a book by your favorite author that you've never read, a literary classic, etc. It's calming for me, a place where I feel safe and protected. Even the smell of a library book is cause for euphoria in my little library-infused world. I remember going to my local library when I was little and walking through the fiction aisle just smelling. Musty old books that have been in the hands of God knows how many people. To some germophobes, that might be disgusting, but I think it's wonderful. Those books brought joy to bibliophiles just like me at some point or another, and, in a way, that bonds us, whoever they were / are. I feel where you're coming from when it comes to lack of punctuation in user-generated electronic media. FaceBook posts are where I see it: My FaceBook friends post song snippets of song lyrics, and I (who don't know any of the songs) have to really work to separate the lines. As for the Kindle thing... I think the biggest problem is one that was in the news recently: Amazon found out that THEY bought pirated copies of an edition of two popular titles (Animal Farm and 1984 by Orwell). In response, they deleted and refunded the copies that they had sold to kindle users... without informing the users first, which caused one user such a big problem that he sued Amazon (I didn't catch who won). My first thoughts on that: That kind of thing CAN'T happen with print-media books. So why SHOULD it happen with electronic ones? Firstly, thanks for the comment, Chris! Always appreciated. I hadn't heard about the pirated e-book debacle. How ridiculous. I'm glad that they deleted it, but they should have informed their users. I can't imagine how that would ruin someone's life so much as to justify that guy suing Amazon. I'll have to do some research and see who won that battle. I LOVE libraries. I spent most of my graduate life in Duke Humfrey's reading room at the Boleian in Oxford, where you're not even allowed to have the windows open because the sunlight might damage the books. i delight in the written word, regardless of format...of course, i'm partial to the printed word and books and musty spines that creak with age. on the other hand, i feel caught between two worlds: after all, i'm an English teacher; there are certain "rules" that i abide by, regardless of the fact that some didn't exist 400 year previous. i despair that "correct" English will soon be lost and no one will remember and that all will be forsaken. yet, i seem part of a generation that disregards such niceties in some writings, mostly tech-related. i think it comes down to tech vs real world and, perhaps, purpose & audience. most people are comfortable, maybe too comfortable, some would argue, with relaxed rules on the Internet (indeed, there are "words" - such as teh - now "accepted" in the net-world because they're so easily mis-typed) and texting, etc. i really don't think it comes down to intelligence or training (i know how to capitalize, i assure you) or education. in some cases, it may be laziness; others, English is the second (or third) language; others, a desire to seem unpretentious. I know I am extremely late on this but it's a topic that touches me as well. I think the kindle is a wonderful device and can't wait to get my hands on one. On the other hand I don't see how it could possibly replace an actual book. The sensory input of walking through a library and the feel of a cover and the pages of a book just taken off the shelf is something that can not be simply replaced by a hand held gadget. I think it's nice having the convenience and choice but I hope books will not go the way of the Dodo. As for our education you are absolutely right. I have seen it with my own children, they were not taught necessary parts of the written language such as punctuation, capitalization or structure. The school they were in also refused to teach script so neither of them could read this type of writing let alone sign their name. I was told with computers it's not necessary for them to learn these things. So I had to teach them myself. I have since noticed young adults around their same age group are having issues with reading, writing and math. It's beyond sad and wrong that our educational system has done this to them. This is an important issue and it's nice to see I am not the only one who has noticed the possible impact from all of this.